Amphion String Quartet | The Chamber Music Society of Lincoln Center. Hailed for its “precision, assertiveness and vigor” (The New York Times) and its “gripping intensity” and “suspenseful and virtuoso playing” (San Francisco Classical Voice), the Amphion String Quartet is a winner of the 2011 Concert Artists Guild Victor Elmaleh Competition. After serving as the Ernst Stiefel String Quartet-In-Residence at the Caramoor Center for the Arts for the 2012-13 season, the ASQ joined The Bowers Program (formerly CMS Two) of the Chamber Music Society of Lincoln Center in fall 2013, featuring the ensemble’s Alice Tully Hall debut in March 2014. Additional highlights of the 2013-14 season include New York performances at Zankel Hall at Carnegie Hall and The Tilles Center at Long Island University, as well as concerts at the Library of Congress, Pepperdine University, Chamber Music Northwest, Sheldon Friends of Chamber Music (Lincoln, NE) and Princeton University. Among Quartet’s many collaborations this season are performances with pianist Gilbert Kalish and clarinetist David Shifrin. In January 2014, the Amphion Quartet flew to the UK to record the group’s first album, featuring quartets by Grieg, Janacek and Wolf, which is due for release in Fall 2014 on the Nimbus label. 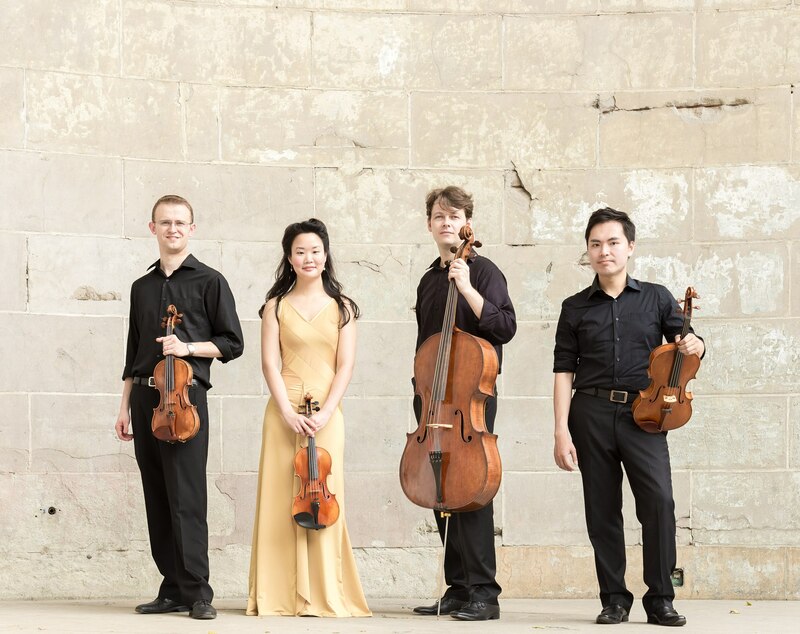 In summer 2013, the ASQ had a diverse schedule of performances and festival appearances including The Chautauqua Institution, NYU String Quartet Workshop, BargeMusic, Princeton Summer Concerts, Cooperstown Chamber Music Festival, Music Mountain and Kneisel Hall Chamber Music Festival, as well as the world premiere performance of a newly commissioned quartet by Yevgeniy Sharlat at the Caramoor Music Festival (commissioned by Caramoor as part of the Stiefel String Quartet residency). 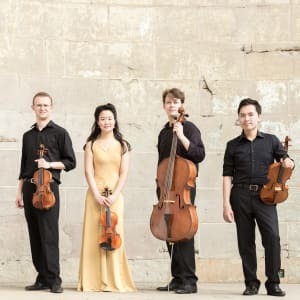 Recent featured concerts include the Amphion Quartet’s Carnegie Hall debut at Weill Recital Hall on the CAG series with guest David Shifrin, the Phillips Collection in Washington DC, Caramoor Center for the Arts, Schneider Concerts, TCAN Center for the Arts (MA), NYC’s National Arts Club, the Met Museum, and a tour of Northern California with concerts at UC San Francisco, Eureka Chamber Music Series and Montalvo Center for the Arts. The ASQ has been showcased on New York’s WQXR radio numerous times, including the station’s November 2012 Beethoven String Quartet Marathon, playing two quartets live in The Greene Space, with live webcast and subsequent airing on the radio. Internationally, the Amphion Quartet has performed in South Korea at the Music Isle Festival in Jeju and at the Seoul Arts Center, with a return planned for summer 2014 for the Busan Chamber Music Festival. Previous US festival appearances include OK Mozart, Chamber Music Northwest, La Jolla Music Society’s SummerFest and the Mostly Music Series in New Jersey. The ASQ has collaborated with such eminent artists as the Tokyo String Quartet, Ani Kavafian, Carter Brey, Edgar Meyer, Michala Petri, James Dunham and Deborah Hoffmann. Violinists Katie Hyun and David Southorn, violist, Wei-Yang Andy Lin, and cellist, Mihai Marica, first joined together for a performance at Sprague Hall at the Yale School of Music in February, 2009. The overwhelmingly positive audience response was the inspiration behind their mutual desire to pursue a career as the Amphion String Quartet. Recent honors include the 2012 Salon de Virtuosi Career Grant in New York; First Prize at the Hugo Kauder String Quartet Competition in New Haven, CT; and First Prize in the Piano and Strings category as well as the Audience Choice Award at the 2010 Plowman Chamber Music Competition held in Columbia, MO.